Before/During: Mix 1-1 1/2 scoops of Cytomax per 16 ounces of water to ensure a proper carbohydrate solution. Drink about 15 minutes before training and consistently during your workout. To ensure proper hydration, drink 32 ounces per hour of exercise. 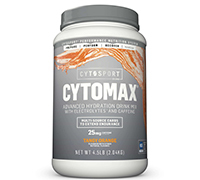 Directions: Mix one to one and a half scoops of Cytomax in 16 oz of water. Begin drinking 15-30 minutes into exercise. Drink 5 oz every 15 minutes. After training, slowly drink another 16 oz over the next hour to aid in recovery.